The LIBOR Market Model (LMM) is the first model of interest rates dynamics consistent with the market practice of pricing interest rate derivatives and therefore it is widely used by financial institution for valuation of interest rate derivatives. 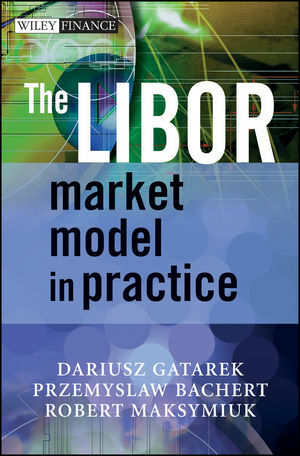 This book provides a full practitioner's approach to the LIBOR Market Model. It adopts the specific language of a quantitative analyst to the largest possible level and is one of first books on the subject written entirely by quants. The book is divided into three parts - theory, calibration and simulation. New and important issues are covered, such as various drift approximations, various parametric and nonparametric calibrations, and the uncertain volatility approach to smile modelling; a version of the HJM model based on market observables and the duality between BGM and HJM models. Co-authored by Dariusz Gatarek, the 'G' in the BGM model who is internationally known for his work on LIBOR market models, this book offers an essential perspective on the global benchmark for short-term interest rates. PRZEMYSLAW BACHERT is a senior financial engineer in the Global Financial Services Risk Management Group at Ernst and Young. He holds his Ph.D. in economics from the University of Lodz. In his work Przemyslaw is responsible for structure derivatives valuation and implementation of risk management systems. He has spent the last six years working with financial institutions in the Europe and Middle East to enhance their risk management capabilities including Algorithmics parameterization. Prior to joining Ernst and Young, Przemyslaw was a financial analyst at Bank Handlowy in Warsaw (Citigroup) where he was responsible for quantitative maintenance of front office system Kondor+. He is also a teacher in the Ernst and Young Academy of Business for the Financial Engineering course which covers the LIBOR Market Model. DARIUSZ GATAREK is Credit Risk Analyst at Glencore UK Ltd. In addition he is a professor at the WSB-National Louis University and the Polish Academy of Sciences. He joined Glencore UK Ltd from NumeriX LLC, where he was Director of Research specializing in interest rate derivatives pricing. Before he was involved in valuing derivatives and designing risk management systems for capital adequacy within the consultancy Deloitte and Touche and several banks. Dariusz has published a number of papers on financial models of which perhaps his work with Alan Brace and Marek Musiela on Brace-Gatarek-Musiela (BGM) models of interest rates dynamics is the most well-known. He is a frequent speaker at conferences worldwide. ROBERT MAKSYMIUK is a senior financial engineer in the Global Financial Services Risk Management Group at Ernst and Young where he is responsible for structured derivatives pricing and implementation of risk management systems for the clients. As consultant he has worked for several financial institutions in the Europe and Middle – East and his activity covered implementation Algo Suite risk management system. Prior to joining Ernst and Young Robert work in BRE Bank where he worked together with Dariusz Gatarek and he was engaged in quantitative research. Additionaly Robert is a teacher in the Ernst and Young Academy of Business for the Financial Engineering course which covers the LIBOR Market Model.